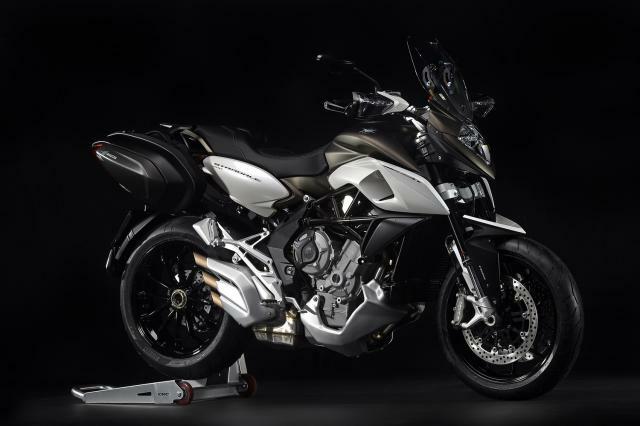 TWO much-leaked new MVs were unveiled at the Eicma Milan motorcycle show yesterday. They are the Turismo Veloce 800, revealed by Visordown last month, and the Stradale 800, which was leaked last week. Using MV’s 798cc three-cylinder engine, the Turismo Veloce 800 will make ‘only’ 110hp but 15% more torque torque than the Rivale and Brutale. It gets the new Motor & Vehicle Integrated Control System (MVICS 2.0), which comprises eight-level traction control and a quickshifter with auto blipper. MV claim fuel consumption has been improved by up to 20% depending on which riding mode is selected. The Turismo has four engine maps: Touring, Rain, Sport and Custom, all of which can be adjusted on the 5” colour TFT digital dash. Parameters that can be tweaked are engine torque, power delivery, ‘rev limiter’ mode, throttle sensitivity, engine brake levels and engine response. The Turismo Veloce 800 is said to be going on sale between March and April next year alongside its higher-spec pannier-equipped sibling, the Turismo Veloce Lusso, which comes with electronic suspension. The Turismo Veloce 800 will cost €15,990 (£12,500) whilst the Lusso version will be priced at €18,990 (£15,000). MV’s Stradale 800 looks to be aimed squarely at competing with Ducati’s touring-ready supermoto, the Hyperstrada. Essentially a Rivale with a fly screen, saddlebags and integrated indicators, the new model also has squared off exhaust tips - instead of rounded - and different wheels. Official tech specs reveal the Stradale will make 115hp - 10hp down on the Rivale due to a lower rev limit which sits at 11,000rpm instead of 13,000rpm. It also makes less torque, only 58ft.lb at 9,000rpm versus the old bike's 62ft.lb at 8,600rpm. Fuel tank size has increased from the Rivale's 12.9L capacity to a 16L tank on the Stradale. Dry weight for the new bike is 181kg.